1. 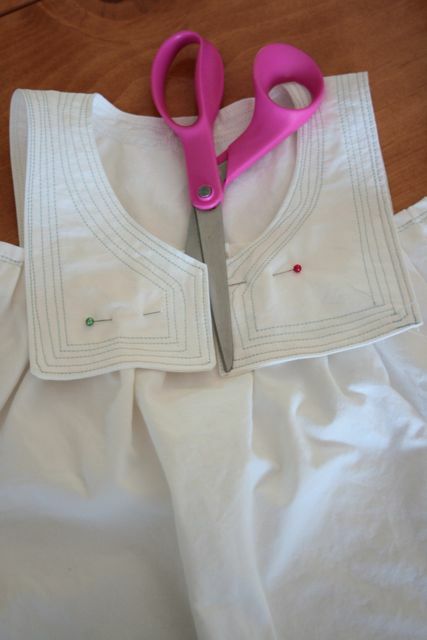 Cut your pillowcase to desired length. I made mine (the left part) long enough to go from Olivia's chest to her knees. 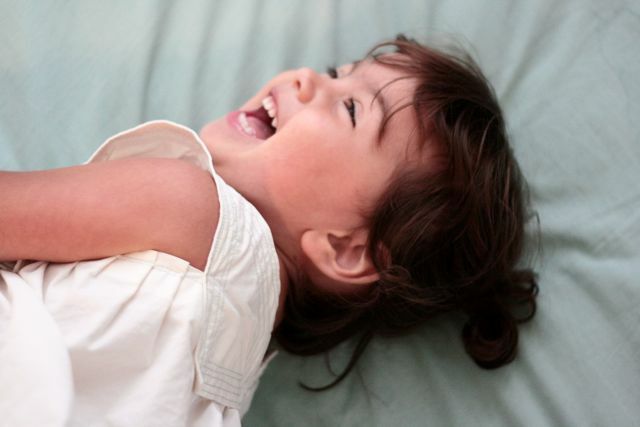 You can measure your own chil'rens to see what size you need! 2. Cut out a rectangle with a slit and a hole (this will be the collar) out of both layers of the top of the pillowcase. There is an opening, so the hole can be smaller than your kid's head... I made a template out of newsprint before I cut it out of the pillowcase. Should written down measurements for you all. 3. Fold under the top of the skirt portion of the dress, 2x, and then stitch, using the right side of your presser foot as the guide for your fabric (1/4 in??). I used a light blue contrasting thread for all my stitching. 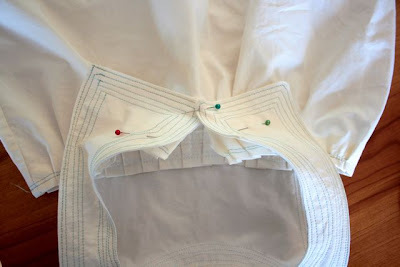 4. either pleat and pin, or throw caution to the wind like I did, and pleat as your sew, all the way around. This part needs to be able to slip over their head and body and fit around the chest. 5. 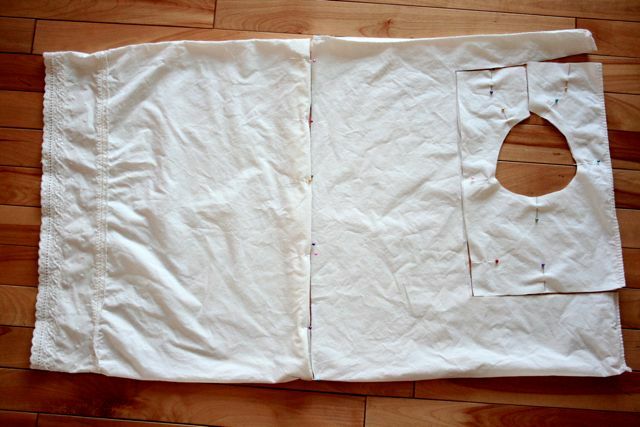 Sew around the rectangle/collar you cut out (1/4 in seam), leaving an opening on one of the sides. 6. Turn it right side out and top stitch two lines 1/8- 1/4 in. 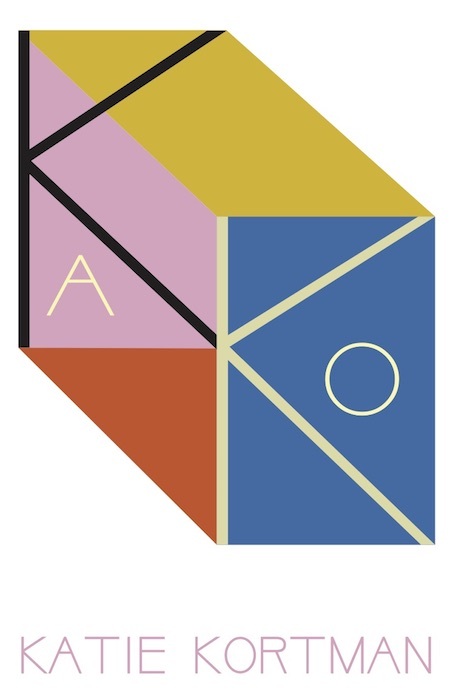 apart (if you want). 7. 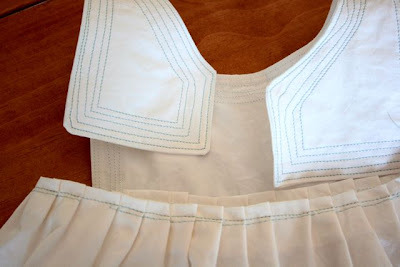 Pin the front part of the collar to your dress portion like above. 8. with the collar pinned to the dress, sew 3-4 more lines all around the collar (see below), each spaced abt. 1/8 in. apart. 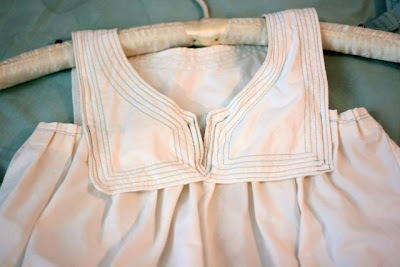 11. pin the bottom corners of the collar so that they overlap over the slit in the dress that you just cut. 12. Sew on top of the lines that you already made/sewed to attache the dress to the collar (both at the slit and on the left and right sides of the collar). 13. If you want, attach some sort of closure. I didn't. It doesn't need one! 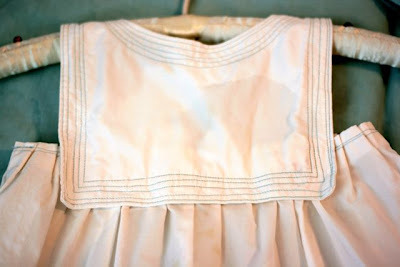 I went back and forth and back and forth about attaching linen tape (my mom's idea), ribbons made from the remnants of the pillowcase scraps, satin ribbon, velvet ribbon, blue fabric strips, a large button, a bow..... But in the end I decided I like it just as it was. Its not overdone. 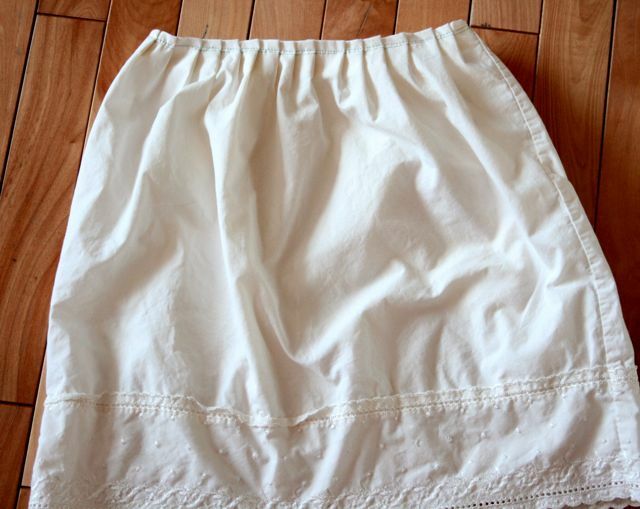 oh and its already been worn, washed and dried here and so sorry, but not ironed. I'd just had a baby when I took these shots! 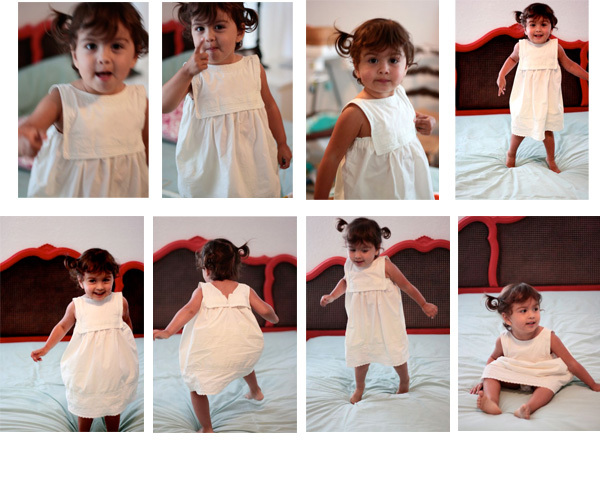 (But I made the dress BEFORE the baby). Sorry. Iron the wrinkles out in your head please. She was so happy she just couldn't stay still. 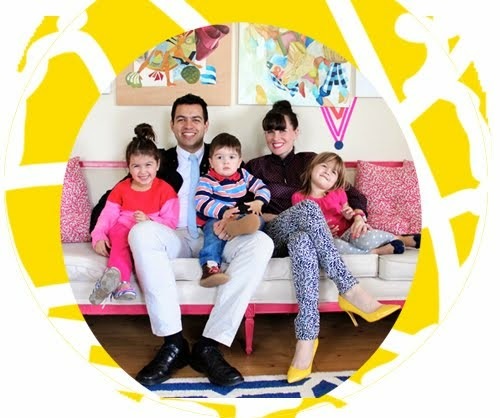 So you aren't going to get some awesome photoshoot like everyone else does on their blogs. Sorry I really really tried. But this kid wouldn't stay still for two seconds!!! Honestly it is gorgeous in person, but since it is white, it was really hard to photograph. Just trust me and go make one! What a great idea to make a dress like that. I will have to wait to have a girl before I can make one. And it looks great on as well! That's DARLING! I love the collar! Thanks so much for sharing the how-to, I'll be linking. I love this dress so, so, much. It is gorgeous, and I think little girls looks so sweet in white. It does look french, and adorable! I'm lucky. I will have a granddaughter in June, I'm bookmarking this! this is beautiful! and playinable - LOVE IT! Will making one for my daughter, and one for a gift. CAN't WAIT! Thanks for sharing!!! I love it, and I love that your sewing lines aren't perfect because mine NEVER are. This is beautiful! Thank you for the instructions ( which I'm borroWIng to make one for my DGD). She will love it. 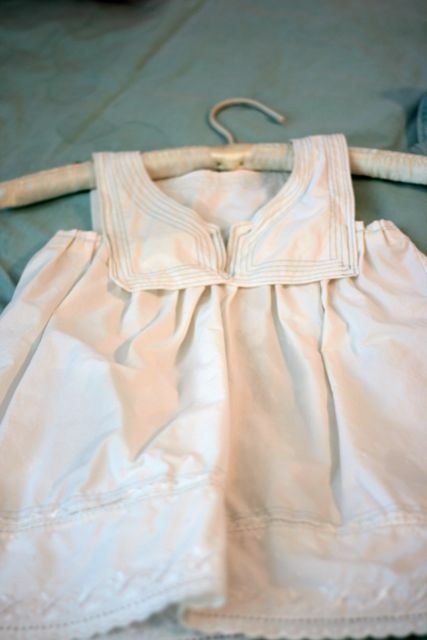 these little dresses are great for donating to Africa. look at the Nancy Zieman site for donation. This is a beautiful dress! Thanks so much for sharing. 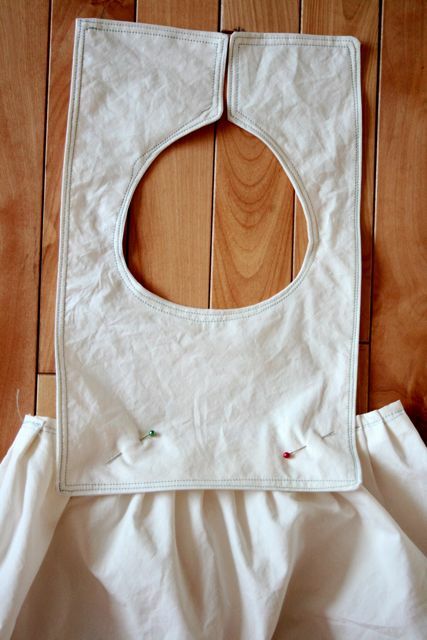 We're in love with it at AllFreeSewing!